Step to the rear, “Noises Off.” There’s a new comedy king traveling the nation that makes “Noises Off seem like a Shakespearean tragedy. 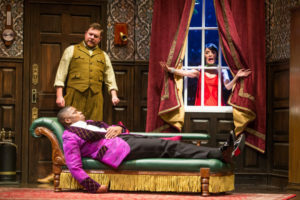 “The Play that Goes Wrong” sets a new standard for silly-slapstick comedy. and not function on cue will astound the audience from the time they enter the auditorium of the Kauffman Center for the Performing Arts. As the doors open for the audience, stage hands can be seen onstage, making adjustments, fixing props, making changes to the set, doing sound checks, etc. Even as they work, things start going wrong. The pre-show sets the table for the feast that follows. And, it is a sumptuous, extravagant, over-the-top, festival of frivolity. 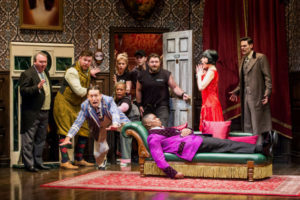 The cast for the national tour of “The Play that Goes Wrong” perfectly times each prank, door slamming, and planned miscue but react like they have never seen it before. The acting is perfection in action. The cast is: Scott Cote, Peyton Crim, Brandon J. Ellis, Angela Grovey, Ned Noyes, Jamie Ann Romeo, Ryan Alexander Smith, Vaegel T. Welch. Understudies are: Blair Baker, Jacqueline Jarrold, Sid Solomon, Michael Thatcher. No words can prepare the audience for what happens as the actual play begins and continues to weave its magical, farcical, physical comedy. The timing and movement is superb throughout. 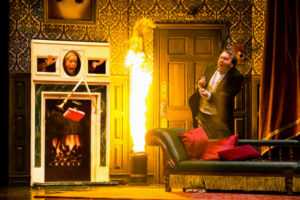 “The Play That Goes Wrong” contains surprise elements no one will expect. The staging is over the top and in Act II just goes beyond the norm on the upstairs scene. Any synopsis or attempt of a synopsis would miserably fail. Anything divulged in a review would lessen the enjoyment of the live performance. “The Play That Goes Wrong” simply defies words and description. The only way to enjoy this art is through experience. Go see it. So many current comedies coming down the pike are black comedies with a fun, lively Act I, followed by the pound-in-the-message Act II. Not very many full-blown comedies see the spotlight or attain any level of success. 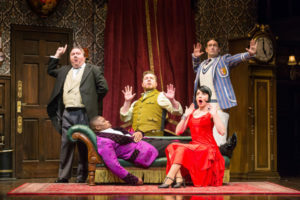 “The Play That Goes Wrong” shatters that theory and presents nothing but physical comedy, zany characters, split-second timing, an unexplainable plot, all performed by a dynamite troupe of actors and stage crew.